칼 라거펠트가 7월의 꾸뛰르 시즌 중에 파리에서 선보일 펜디의 모피 꾸뛰르 (Haute Fourrure)는 하이패션과 모피가 구축한 고상한 두 세계에 극적인 대 변동을 가져 올 것이다. 이미 밀라노에서 에너지 넘치는 하이퍼 모던한 펜디 컬렉션을 선보였던 라거펠트는 20세기 스위스 아티스트인 소피 토이베르 아르프(Sophie Taeuber-Arp)의 그래픽 작업으로부터 영감을 받았다고 밝히며, 파리의 쇼는 모두 예정된 바였다고 말했다. “펜디 컬렉션은 사실 하이엔드 모피를 다룰 여력이 없어요. 기성복 라인이 지금 너무나 순조롭기 때문이죠”. 라거펠트가 실비아 벤튜리니 펜디(Silvia Venturini Fendi)와 함께 청중을 향한 그 특유의 피날레 인사를 하고 난 후 이야기했다. 런웨이의 양 벽은 기하학적이고 추상적인 예술 작품 이미지들로 가득 장식되어 있었다. .
펜디의 CEO인 피에트로 베차리 (Pietro Beccari)는 지난 2년 간 브랜드를 발전시키기 위해 많은 노력을 해왔다. 이번 파리 모피 쇼에 대한 그의 코멘트를 직접 듣지는 못했지만, 펜디를 소유한 LVMH 그룹으로서는 펜디를 가장 중요한 글로벌 모피 브랜드로서 지위를 공고히 하려는 것이 당연할 것이다. 의미심장하게도, 이달 뉴욕에 새로 개점한 펜디 스토어는 이례적인 모피 쇼케이스를 열기도 했다. 역설적이면서도 이 새로운 환경 속에서는 당연하게도, 모피는 2015년 가을/겨울 컬렉션에서 주목 받는 주인공은 아니었다. 대신에 컬렉션은 날씬한 실루엣의 흰 의상으로 막을 열었다. 그리고는 붉은 색이 등장하기 시작하고, 이번 컬렉션의 메인 컬러였던 오렌지, 겨자색 그리고 빨간색의 색조들이 펼쳐졌다. 매번 다양한 모피의 향연을 보여주던 펜디는 이번 시즌에는 무통에 중심을 둔 듯 했다. 때로는 그저 “기타” 모피도 등장했다. 이를테면 몽고 양가죽으로 만든 레그 워머가 그렇다. 이 곱슬곱슬한 털은 긴 장갑의 팔꿈치를 장식하기도 했다. 하의를 위한 또 다른 변주로는 남미의 카우보이인 가우초들이 입었을 법한 가죽 바지가 있었다. 보송보송한 모피 액세서리는 이번 시즌에 가방장식으로 사용된 극락조화가 보여준 위협적인 효과로부터 도전을 받기도 했다. 그러나 칼이 예술적인 안목과 세련된 정신으로 소피 토이베르로부터 뽑아낸 형태와 볼륨은 돋보였다. 그 중 몇몇은 그야말로 패션의 기하학이나 마찬가지였다. 커다란 삼각형 형태의 짧은 코트라던지, 수많은 사각형이 반복해서 만들어진 미드리프(midriff, 가슴 아래 선까지 내려오는 아주 짧은 상의) 스타일의 패널 드레스처럼 말이다. “가까운 과거로부터 온 것이 아님에도 매우 그래픽적이고 매우 간결하며 매우 현대적이죠.” 라거펠트가 백스테이지에서 말했다. 그러더니 구찌의 로맨틱한 새 디자이너를 향해 특유의 신랄한 어조로 덧붙였다. “여긴 벼룩 시장이 아닙니다”. 여든 몇 살의 칼 라거펠트가 정말 펜디의 하이엔드 모피와 함께 샤넬에 필적할 만한 또 다른 컬렉션을 내놓을 것인가? 칼을 잘 알고 있는 나는 “당연하지!”라고 대답하리라. 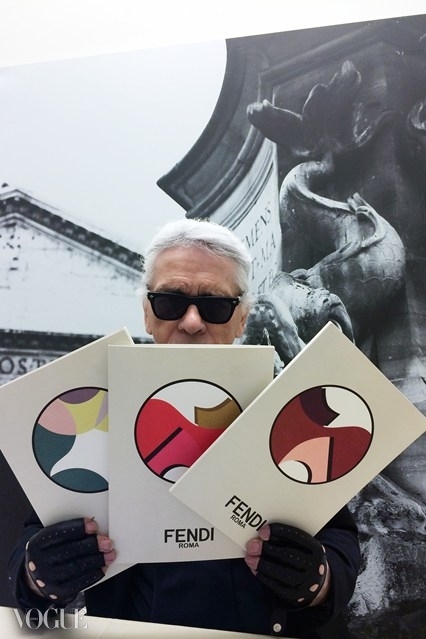 Lagerfeld – who showed a powered-up, hyper-modern Fendi collection in Milan, inspired by the graphic work of the Twenties Swiss artist Sophie Taeuber-Arp – said that the Paris show was definitely scheduled. 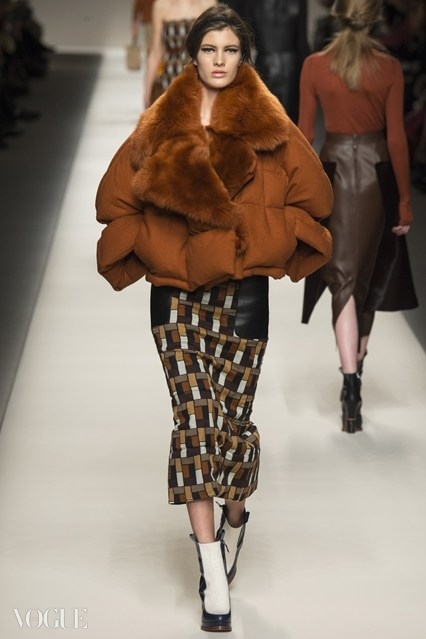 Paradoxically, but understandably in the new circumstances, fur was not the attention snatcher for autumn/winter 2015. Instead the collection opened with a lean, white silhouette, maybe set off by red. After that palette cleanser came patches of colour in shades of orange, mustard and red, which were the dominant hues. 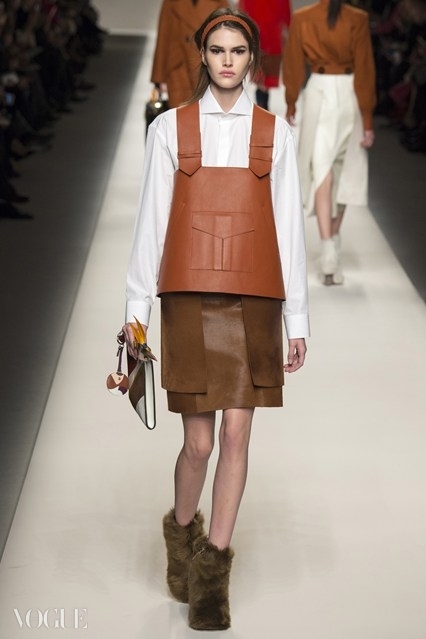 The fur focus seemed to be on shearling, although Fendi always offers a furry puzzle. Sometimes there were just fur “extras”, such as Mongolian lamb leg-warmers. The same curly fur came at the elbow of long gloves. Another variation on leg interest were leather chaps as worn by Latin American gauchos. Fluffy fur accessories were challenged this season by the “shark” effects of Bird of Paradise flowers that were used as decoration for handbags. 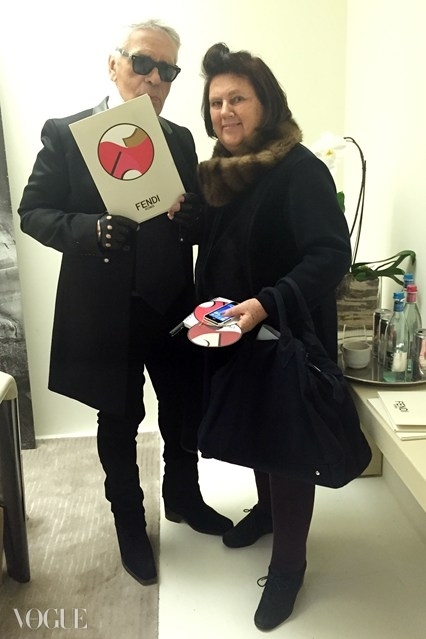 But what stood out were the shapes and volumes extracted from Sophie Taeuber by Karl’s artistic eye and cultured mind. A few were fashion “Geometricks” using vast triangular shapes for short coats; or gigantic riffs on squares, worn as a midriff frame on a panelled dress.